Hold onto your party hats, because I’m about to tell you how to throw the most incredible, fantastical, unforgettable celebration. My unforgettable party didn’t really begin like most parties do, with an unalloyed cause for celebration. No birthday, no wedding, no anniversary. In fact, the party was born out of a dire state of heartsickness. You see, I was listening to the news, daily, and hearing the voices of those elected to lead us assert that the security of our country was threatened by refugees. I know, as you do, that there's no evidence that refugees pose a danger to our way of life. On the contrary, I believe, as our country’s founders believed, that diverse strands make for a vigorous nation, and people who have to surmount impossible odds to land on our shores are the strong and dynamic people we need beside us, making the world a better place. I decided to host a fundraiser for International Neighbors of Charlottesville. I needed a way to engage with goodness and grace. Turns out, I wasn’t alone. Within weeks of floating the idea on Facebook, the party was alive. 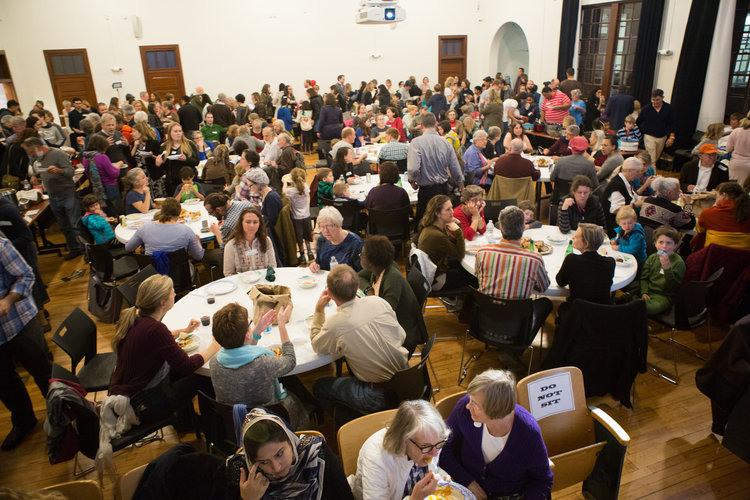 Designed to celebrate and honor the diverse strands of our community, the evening was organized around soup. Yes, soup. A humble conveyer of celebration, perhaps, but a worthy one. 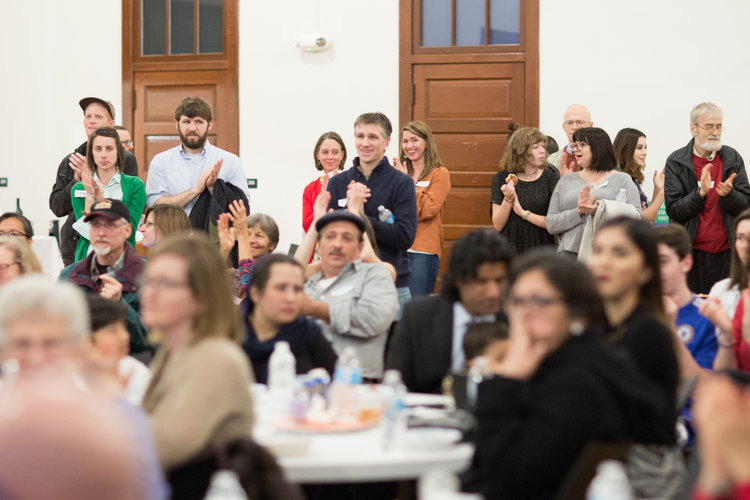 You see, we gathered almost 40 soupmakers to bring crockpots of their most delicious soups and stews, and invited Charlottesville to join us for supper. Entry fee was whatever guests felt they would spend on a celebratory evening out—which means we also honored inclusion by welcoming anyone who wanted to join us (rather than a hundred-bucks-a-plate fête). 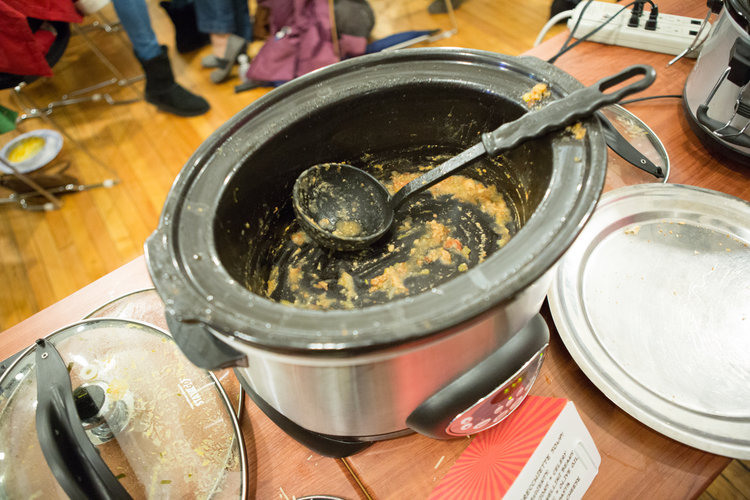 "We gathered almost 40 soupmakers to bring crockpots of their most delicious soups and stews, and invited Charlottesville to join us for supper. " Once in, guests gathered to sample soup and later desserts made by volunteers (including members of the refuge community who were eager to give back) and bread donated by every single one of our local bakeries. Our speaker line-up included Dahlia Lithwick, a nationally regarded Supreme Court journalist and senior editor at Slate who lives in Charlottesville; Kari Miller, a former teacher who founded International Neighbors about a year ago; and five people in the local refugee community who shared their stories. We hoped to host 150 people and raise $5,000. That amount of money would provide driving lessons for 5 adults to get their license (our town’s public transportation means that even traveling a few miles can take hours), music lessons for 15 children and swim lessons for 7, 5 computers, 10 bilingual buddies for learning English, and dental visits for 25 children (after years of camp living without dental hygiene, refugees arrive in desperate need of dental care which Medicaid only partially covers). If we raised an additional $1,500, we could help International Neighbors support members of the local refugee community with four dental visits for adults (Medicaid doesn’t cover dental for adults at all, so their only option is to have their teeth removed at the Free Clinic), a gym membership for two adults with PTSD to gain both physical and mental health, and one bus pass (when one’s entire paycheck goes toward rent and paying back the airfare for getting to this country, it can be hard to scrape up the extra $240 for a bus pass). The event was more successful than any of us had dared hope. Over 300 people attended. So many that guests shaking off their umbrellas cheerfully announced that the streets around the venue were packed—no parking was found at any of the nearby lots. My husband had to run to Staples to print more receipts for the tax-deductible donations. And a volunteer had to dash out to fetch more spoons. At the end of the evening, I had the breathless joy of announcing that we’d more than doubled our goal, raising $13,000. The room erupted with people leaping to their feet to whoop and cheer. Kari and I fell into each other’s arms, overcome with gratitude. By the time all the final donations were tallied, we’d crossed the $16,500 mark. We raised awareness for a local organization doing good work (and increased their volunteer roster, including a dentist who has now generously volunteered his time). 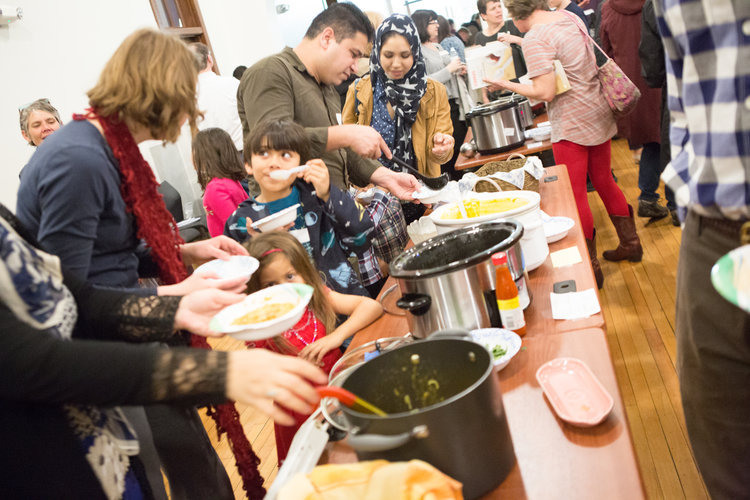 By including the refugee community in the gathering not only as guests and speakers but also accepting their gracious offers to provide food, we folded them into our community. And by providing an opportunity for people to gather around a simple supper with a simple goal, we reminded our town of how good it feels to connect, embrace, and give. IN SHORT? BEST. PARTY. EVER. 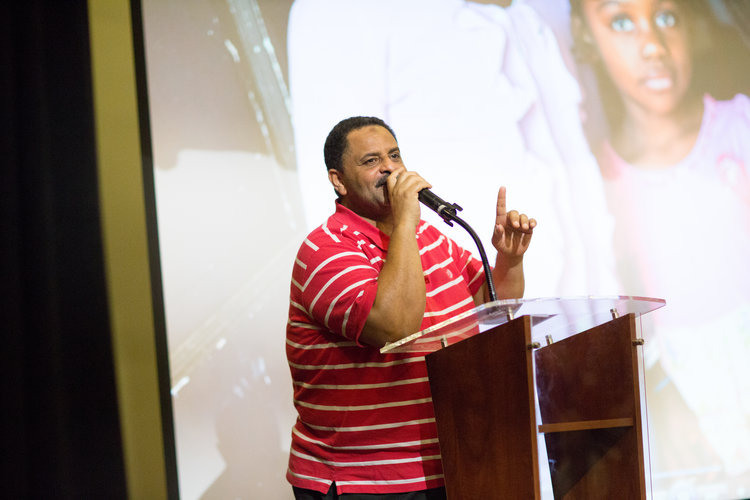 "By providing an opportunity for people to gather around a simple supper with a simple goal, we reminded our town of how good it feels to connect, embrace, and give." So how do you host your own best party ever? Nothing could be easier. 1) Pick a cause you are passionate about. Particularly one that feels emotionally current, so that others want to participate. The cause that always gets me where I live is marginalized people. I can’t imagine how painful and scary it would be to not only be an outsider in terms of language and culture, but to also be sent the message that you are unwanted and worthless and even demonized. Kari spoke about recent immigrants who had their homes defiled with eggs and dirty diapers, scrawled with the word, “terrorist.” It’s unconscionable. 2) Put out a call for organizers. It helps if your organizers have a wide and varied social network—churches, work, friends, hobbies. 3) Reach out to the organization you want to support. Meet with the head of that organization. Go in open about their needs. Learn specifics about what the donations would fund (people will be less likely to support admin and staff, they want to feel like they are making a direct difference, particularly right now, when it feels like everything is slipping through their fingers), and if that director would be willing to speak. Bonus if they can encourage others to speak as well. 4) Think of who else might speak. Any local luminaries? Any friends gifted with oratory excellence? Those speakers will not just create an attendance draw, they will give you a hook when you write your press release. So call in all favors. 5) Pick a date that fits your organization and speakers’ schedule. Don’t rule out weekdays. People are busier on weekends than one would think. 6) Find a venue. This is tricky if you don’t know how many people to expect, so you may want a space that can be flexible. Elegance is not the object here, so be open to church basements and school cafeterias. Have your organizers help unearth all possibilities. You’ll want a venue that’s free or underwritten by someone so that 100% of the donations acquired go straight to helping the people you want to help. 7) Make donations easy, and tout that donations are tax-deductible (if they are) and that 100% of donation go straight to the organization (if they do). Create a web page for soliciting donations (there are many platforms, you can see ours at Better World Collective). We made over $3,000 off of that donation page alone, which was shared widely on Facebook. Also, plan ahead to get a Square to make credit card donations simple (it's free when you request one on-line). You’ll need your target organization's bank information so that donations get deposited into their account. By the way, in Square, you can modify the receipt with your organizations 501(c)3 number so that that receipt serves as evidence of a tax-deductible donation. If your organization has Square set up on one of their devices you can just use theirs, or have an extra device for the long lines you’ll hopefully have. 8) Try to solicit a challenge grant, if you or your organizers know any big-time donors. Ours landed in our laps: a friend of mine offered $1,500 if we met our $5,000 goal. A challenge grant can encourage people to donate just a little bit extra in the hopes of that translating into big gains for real people. 9) Make a Facebook event page. Make sure that you include all your organizers as hosts, and that you make your “About” section compelling. Name your goal, and how that money will be used—being as specific as you can to engage the imagination of donors (they need to feel that there will be real impact from their donation). Have your organizers share this event page widely by inviting their friends and also sharing the event on their page. Make sure your Facebook event page includes a link to the donation page you created. You’d be surprised (and more than a little pleased) at the number of people who will want to support your mission, even if they can’t attend. 11) Ask your organizers to form teams of soup and dessert makers. Each crockpot of soup can feed about 10, each batch of dessert (I recommend sticking to handheld desserts like cookies, brownies, blondies) can feed about 20. You communicate details about the event to your organizers, and they convey all of that to their teams. What information do they convey? It depends on your event, but for ours it was that each team (organizer plus their soup makers) needed to bring: enough surge protectors and extension cords (depending on the outlet situation of the venue and the size of the team), a few platters for dessert and bread, a bread knife and cutting board if bread will be arriving unsliced. In addition, every soup maker needed to bring their soup in a crockpot with a ladle, the soup needed to be labeled with kind and ingredients (for allergies), and every single thing needed to be labeled with the team member's name. 12) Draft a letter that your organizers can send to all of their friends. Again, just pulling from what you already wrote up for the event page/press release. Many possible donors aren’t on Facebook, so make sure they know about your event, and also how they can contribute even if they can’t attend. 13) Think through the event to ponder what your needs may be. Some volunteers will want to help but won’t be able to make soup. Assign them bottles of water or paper goods—plates, napkins, spoons, bowls. Will you need paper towels? Garbage bags? Cleanup supplies? 14) Ask your volunteers to solicit donations from local businesses. Every one of our local bakeries happily donated bread. Businesses may be very eager to help by providing soup (three of ours did, and I believe that’s all that were approached). Having local businesses contribute feeds a feeling of an embracing community. "Every one of our local bakeries happily donated bread. . . . Having local businesses contribute feeds a feeling of an embracing community." 15) Stay organized. Keep a spreadsheet of how many soup and dessert makers and water bringers and paper product donors you have signed up by team. Plan for much more soup than you’ll need. Remember that for every one person who RSVPs via Facebook, that likely includes 1-3 more people, as families will only RSVP for one. 16) Be creative and make the most of your communal resources. One of our organizers, Susan Parmar, had taken beautiful photos of our local refugee kids for IN's website, so she sent them to my husband who compiled them into a slideshow we had running all night on screens around the venue. I bought 30 signs that say in Spanish, English, and Arabic "No matter where you are from, we're glad you're our neighbor," and set my daughter up in the corner to sell them (not for a profit, obviously). Also, when I heard that events like these often lead to a segregated groups, I thought about how to make mingling easier. I hit on the idea of having a name-tag station where people not only wrote their name, but also what they made (if they made a soup or dessert) and what country or countries their family hailed from. I figured these would create easy ways to make conversation. In addition, I thought about how hard it was to be a stranger in a strange land. I thought about how just having someone look me in the eyes and welcome me meant the world. So I asked the organizers to do just that—to think of themselves at hosts and make sure everyone felt included and welcomed. I also asked that they communicate the same to their soup teams. It worked for us, everyone was folded in—kids playing across the divide, adults supping at tables with strangers. There was an active, dynamic burble of camaraderie that I think could have been absent if connection hadn’t been our explicit intention. 17) Involve the organization you are supporting while making sure not to burden them. It was talking with Kari that prompted the idea of having some of the refugees tell their stories (which was definitely the high point of the evening), and International Neighbors was so enthusiastic they were able to support the refugees attendance by bringing them and conveying our appreciation for their offers to share their soups and desserts with our guests. 18) Go over the plan for the event with your organizers, but make it clear you are counting on them to use their own gut and intellect for problems that arise. For example, I conveyed to organizers that we’d have soup and chatting (and consulting with the IN staff at a designated table about volunteer opportunities) from 6-7, then we’d have speakers until around 7:45, then we’d put out dessert, and the event would wrap up by 9. I told them that we’d have to take turns taking donations at the door. Our venue had very small trash receptacles, so I asked all the organizers to keep watch for when the trash needed to be taken out. Other than that, I trusted them to make the right choices. They were superstars. Truly. Every time I looked up, panicked at what I’d neglected to do, I saw that they were already on it, in a more creative and efficient way than I would’ve directed them. I believed that they were smart, capable, intuitive women and they more than proved me right. This is all to say—avoid micromanaging, and trust your team. 19) Make sure you have a greeter from the organization who can fill out receipts for tax purposes and a greeter from the event (i.e., an organizer) at the door. Both should be able to run credit cards. 20) Bring to the event index cards and pens for people who forget to label their soups, labels for people who forget to label, a box to keep donations, your Square and device, directions for greeters, name tags and pens and directions for the name tags, and a pad of paper you can stick in your purse. There will likely be issues people raise that you’ll want to include in your speech (we ended up having our state delegate in attendance and others looking for signatures to get on the ballot), and also people will approach you during the event with ideas and offers to contribute in the future. You’ll want a way to remember all that, as your brain will be a sieve. 21) Draft a speech. It wasn’t until about 2:00 in the morning the day of the event that I realized I’d have to make a speech. Thank goodness my husband had been paying attention at all these events we’ve been to because he could guide me on what I was supposed to do: remind people why we were gathered, thank the organizers by name, thank the venue, thank the soup makers, thank the refugee community for joining us, and introduce Dahlia who would be introducing Kari. Leave room for applause—people really will be excited to be there. While speakers are speaking, have someone totaling the donations thus far, so that if you exceed your goal you can announce it before the event wraps up. I’m not entirely sure. There are tentative plans to make a cookbook of recipes from the soup and dessert makers, which we can sell as another source of donations for International Neighbors. I can’t imagine we’ll ever emotionally or financially top the best ever party, but I’ve also learned in this process that there is more goodness in the world than I knew. For the original, unabridged version of this blog post, please visit this page. Michelle Damiani is a freelance writer, clinical psychologist, and food lover currently living in Charlottesville, VA. Her heart, however, is in Spello, Italy, where she and her family spent a year growing accustomed to being fish out of water, grappling with the hardships of parenting on foreign soil, and ultimately cleaving into the soul of Italian village life. While in Italy, Michelle used the time that her children were in Italian public schools to write a blog about their experiences. The blog, Il Bel Centro, was awarded the bronze award for best Italian blog by Expatsblog. Once back in Charlottesville, she transformed the blog into a book, Il Bel Centro: a Year in the Beautiful Center. Her daily life in Umbria later inspired her new novel, Santa Lucia. Written in sweeping telenovela style, and packed with drama, Santa Lucia is nonetheless grounded in the green heart of Italy. Photos courtesy of Susan Parmar.